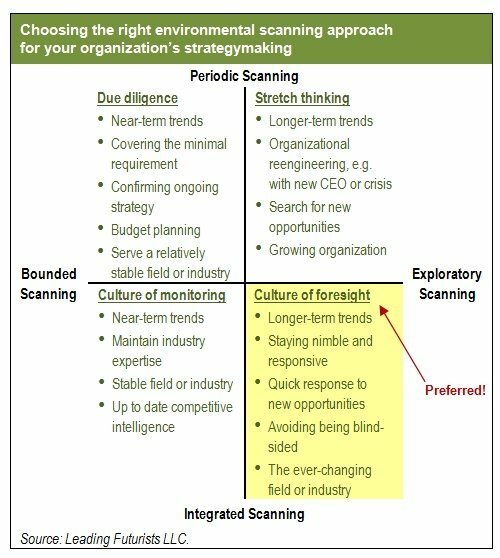 The diagram above looks at how organizations may choose to monitor the forces and trends acting on their interests. It can help you consider how you do environmental scanning, and how to make it more valuable to you and your colleagues. Most competent organizations do periodic scanning, formally or informally, but they often do it in a bounded way. They get the obvious periodic due diligence done or have an ongoing culture of monitoring. They catch up with and keep up with their industry or sector, or current markets. But they often miss the longer-term forces that will shape their futures, and don't get early notice of the more speculative or hidden things that may become critically important. It's better to include some stretch thinking–to at least periodically explore beyond the current view of what's happening and what's important. Even better, the culture of foresight approach covers good monitoring of the sector, the market, etc. and the due diligence you need, stretches thinking, but makes those things a continuous habit. That is probably critical to your organization's success, and can move you from reacting to change, to anticipating it and discovering new opportunities. Im currently studying PR, I would like to know how often should you do environmental scanning and how long does it? Thanks for asking a great question. I have a sort of radical answer to it. You should do environmental scanning all the time, it should be a part of any leader, executive, or analyst’s daily work. Absorb information and ideas from everything you do, and work to see sources of fresh insights every day. In a sense, then, the time and effort become invisible, and are like breathing or eating: things that make you strong, resilient, and that you do daily, no matter what. Now formalizing environmental scanning a little, and adding to the notion a group process, means perhaps a periodic cooperative effort to inventory and discuss the big forces and trends shaping whatever it is you are interested in. I’d say give that recurring group/team time, free from other chores and distractions–i.e. really explore and really discuss the big trends. That means devoting quality time, and that may mean devoting as much as a few hours a week to the effort. The precise time commitment will depend on the team and individual abilities and the degree to which my first point becomes true for you, in other words the degree to which you routine have a fix on the forces at play. Nicole, one more important tidbit. In the UK and Europe, and perhaps becoming true everywhere, this process is usually called “Horizon Scanning”.